First class Houston to Seattle dinner consisted of two options. Five cheese ravioli and pretzel bread burger. I opted for the burger. It came delightfully warm with just enough heat between the bun and burger to delicately melt the cheese once I put it on the patty. Lettuce tomato pickles ketchup mustard. 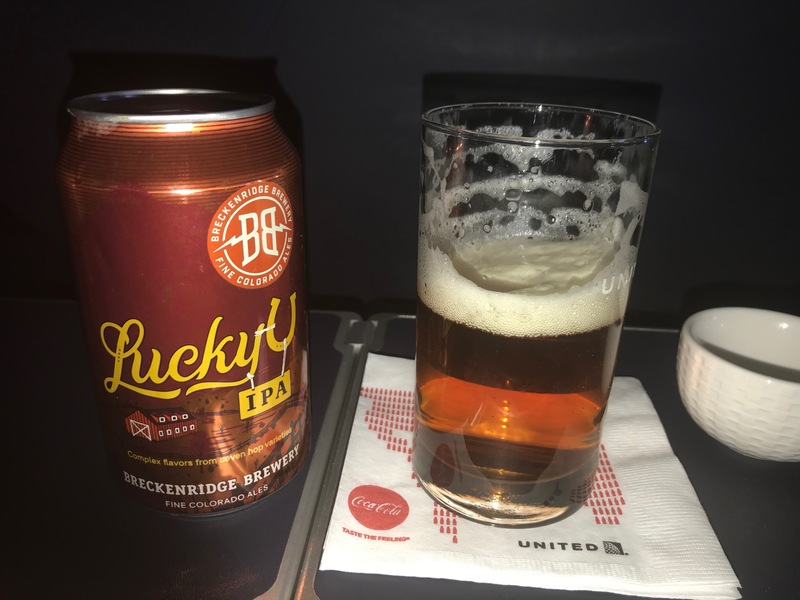 I paired it with a beer called lucky u IPA from Breckenridge brewery “fine Colorado ales” the color was to my liking. Amber with almost a hint of red. The flavor was hoppy and a bit nutty. It had a soft bite and a smooth finish. A bit frothy do be careful on the pour. The salad consisted of fresh baby spinach a single cherry tomato posited with a single Mediterranean olive and fetta cheese. The dressing was a honey Dijon dressing which i found to be an odd pairing. I would have preferred a Greek dressing or a simple basalmic vinegar. Chewing that marvelous olive was diminished by the overly sweet salad dressing. Lucky for me the lucky u IPA did an excellent job of washing the taste of that dressing away! For dessert we had a raspberry cheesecake 🍰. Delicious to the last and will paired with a glass of the red wine.